China Vanke is a leading Chinese real estate development and property services company. The company seems to have a sustainable business model which aims at creating true value in the real economy. In 2018, the company ranked #332 on Fortune’s Global 500 list. The company has a strong balance sheet and firm profitability metrics. Valuation suggests the company’s shares are significantly undervalued. In the past years, shares of China Vanke (OTCPK:CHVKF) have experienced a period of steady growth which could be just at its beginning as the company is well positioned to benefit from long-term favorable trends such as urbanization and steadily growing demand for the new property on the Chinese market. China Vanke is a Shenzhen-based real estate development and property management company which mainly develops commodity residential housings as well as commercial property and leisure property. The company was several times voted as the best investor relations company in Asia and gained a reputation for being a quality leader valuing customer experience. According to the company’s tenets outlined in the investor presentation, the company is focusing on providing true value in the real economy through building housing for accommodation and not for speculation as was the case of many peer companies. The company owns and operates several subsidiaries such as SCPG Holding Co. or Vanke Ppt Ovs. For three years now, China Vanke regularly ranks on Fortune’s Global 500 companies’ list. This year, the company placed #332 which is 24 places up against the year it entered the list for the first time. This is a remarkable international recognition that could help the company further advance it business. Looking at the company’s website traffic, most of Vanke’s main page visitors come unsurprisingly from its domestic market, with the rest from Hong Kong, Vietnam and Malaysia. In March 2019, the company’s website recorded almost a million visits. Over the last five years, China Vanke’s profitability metrics have reached extraordinary levels. Based on Reuters statistics, the company’s twelve months trailing return on assets, return on equity and return investment total 3.8, 22 and 17 percent respectively. These figures are high above the industry and sector averages, which in case of the return on investment’s metric, are more than two times higher. 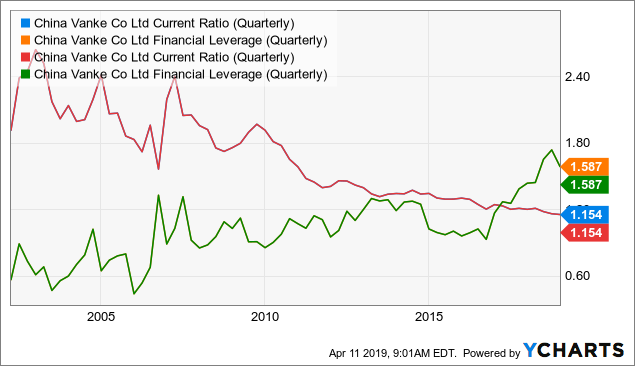 Lastly, taking a closer look at the company’s financial leverage and current ratio, one can quickly notice that the company has become financially riskier as liquidity declined but, on the other hand, still showcase acceptable levels of both leverage and liquidity ratios. Plugging-in Vanke's financial statements' figures into my DCF template, the company’s shares seem to be severely undervalued. Under perpetuity growth method with a terminal growth rate of 2 percent, steady 20 percent annual revenue growth over the next five years, 20 percent EBIT margin assumptions (extrapolating the current rate), fair value of the stock comes at 173 HKD. Under the EBITDA multiple approach of a discounted cash flow model, the intrinsic value per share value of the company stands ‘only‘ at 68 HKD if we assume that the appropriate exit EV/EBITDA multiple in five years' time is around 7x. The median fair value estimate is then $120 HKD which is an equivalent of approximately $15 USD. The company has been constantly issuing new shares which could lead to significant equity dilution. Adverse economic conditions and negative developments on the Chinese credit markets could adversely impact the company’s operations and financial results. If the company fails to address the organizational challenges associated with the increasing size of the business, its operations may be negatively impacted. If the company fails to prevent information system breaches or cyber attacks, its reputation may be compromised. Natural disasters and infrastructure disruptions such as earthquakes, hurricanes and tornados may negatively impact the company’s operations and financial condition. The company’s people represent a key asset of the business and if the company fails to retain the existing employees and attract new talent, its operations and financial condition may be adversely affected. To sum up, China Vanke is an exceptional real estate development company operating in one of the fastest-growing and largest markets in the world. The secret sauce behind the company’s success is so-called Vanke way which puts an emphasis on synchronization of the company’s development with those of its customers and property services which expanded at a rate greater than 70 percent in the most recent financial year. With quality core development and various noteworthy side projects such as The Horizontal Skyscraper by Steven Holl, numerous ski resorts, elderly care and education centers, China Vanke is very likely early in its growth stage. Additional disclosure: Disclaimer: Please note that this article has an informative purpose, expresses its author's opinion, and does not constitute investment recommendation or advice. The author does not know individual investor's circumstances, portfolio constraints, etc. Readers are expected to do their own analysis prior to making any investment decisions.